Last week in part one of this series, I talked about the three massive client-repelling mistakes I made when I was first starting out online with my copywriting business, and what I did to fix them. A caveat: This is an iterative process, so you’ll want to be tweaking and perfecting it as you go. What this means is you do not have to have every single detail of your ideal client/customer avatar and every single one of their challenges figured out before you start implementing this into your business. Just start somewhere and tweak as you go – that’s what I did. What happens when you have a poorly defined target audience? You spend countless hours working yourself to a frazzle creating blog posts, videos, email newsletters, social media status updates, and all other conceivable kinds of content to show off your expertise – yet your online marketing isn’t converting people into email subscribers, client inquiries or new clients. The clients you do seem to get aren’t ideal – they’re price shoppers, pains-in-the-arse, or for some other reason just plain dreadful. The kind of clients who make you want to plunge 10-inch knitting needles into your eyes. Very painful. Because of the time and effort you’re putting in, and the kind of clients you’re working with, you also may be weary, worn out, drained, despondent, and just about ready to give up on this here online marketing thing. The bottom line is, if you haven’t defined your ideal client/perfect customer/target audience, then you’re trying to talk to “everybody” with your content – which means it’s most likely bland and boring and homogenous. And that means that as lovingly crafted and well-written as it may be, it won’t convert enough readers into clients and potential clients. You’ll be like a hamster on a wheel, forever doomed to create more and more and more content, yet never reach your business goals (said the former hamster-on-a-wheel who kept on creating more and more content, yet didn’t reach her business goals). The good news is, you can get this figured out and turn the ship around, and when you do, it will change your business forever. You’ll no longer feel like you’re pushing a boulder uphill with a feather (to mix a whole bunch of unrelated metaphors). Everything will become easier. What happens when you define your target audience? Because you know exactly who you’re talking to and what they struggle with, every piece of content you create will be much easier to produce. You won’t struggle over what topics to cover in your blog posts, email newsletters, and social media status updates. You’ll know exactly which blogs to pitch for guest posting opportunities. You’ll know what kind of free opt-in offer to create to get subscribers onto your email list, and what kind of paid offerings to create. As a result of your targeted content, you’ll attract the “right” kind of clients, those who are perfect for what you have to offer and who are a dream to work with. The stress and overwhelm will lessen, and that feeling of working yourself to a frazzle for next to zero results? Gone. You’ll convert more sales because your targeted content demonstrates that you have a deep understanding of your ideal clients and what they struggle with, and that you offer an ideal solution specifically geared to them. In short, you will have marketing clarity. And as we said in part one of this series . . .
Marketing clarity is like gold, because once you have it, you’ll be able to captivate your ideal clients, get them interested enough to stick around and read your content/view your portfolio/sign up for your newsletter, and eventually, reach out to buy your thing or find out more about working with you. So how do you determine who your ideal client is and figure out the challenges and problems you can help them solve? This is a process that takes time, one you’ll be tweaking on an ongoing basis. That said, if you’re just starting out, you probably have at least some idea of who it is you want to serve, and if you’ve been at your business for a while, you already know the kind of clients you love serving and those you don’t. That’s a start, but we need to go way deeper than this. If you want your web and other marketing to grab people by the lapels and make them so excited they’ve found you that they can’t wait to find out more about your services and what they have to do to hire you, then you need to demonstrate that you understand them intimately, that you know their struggles and challenges, and that you offer the ideal solution, for them. This kind of core understanding of your clients builds trust, and trust results in more sales. So you start with the basic information you have and begin digging really deep to figure out everything else you can about them – their deepest desires and fears, what keeps them up at night, their core beliefs, what frightens and excites them, what encourages and inspires them, and so on, as it relates to the product or service you provide. It’s about human behavior and psychology – you’ve got to understand your customers on this core level to really deliver the kind of marketing juice that converts. Once you have this information, you’ll be able to create web content, blog posts, email newsletters, free opt-in offers, and PAID OFFERINGS (sorry about the shouting) that speak directly to your ideal clients’ most pressing concerns and deepest desires, and connect with them in a real and compelling way. The kind of marketing that’s a natural by-product of this work makes your ideal clients feel deeply understood. This is very powerful – for you and for them. Everybody wins. But where do I find this information, you wonder? The very best way to get to the core of what your ideal clients struggle with – not what you think they struggle with, but what they actually struggle with, in their own words – is to simply ask them. Really. It can be that simple. But don’t just ask one or two people, ask several; heck, ask as many as you possibly can, because this will only help you create authentic, compelling marketing that nets you ideal clients instead of duds. If you don’t yet have clients in the target audience you want to serve, then find friends, family members and acquaintances who are representative of your ideal clients, and talk to them about their frustrations and fears related to the product or service you offer. This is what I did. I knew I wanted to serve creative entrepreneurs – solopreneurs and small businesses who sell a creative product or service – but my copywriting clients were in the healthcare and real estate niches. So I talked to friends with small creative businesses; I also asked business owners in my target audience who I know from a networking group I belong to if I could buy them coffee and ask them a few questions. OK, I get it, ask people. But what else? Here’s what I did – I pored over comments on my own blog, comments on other blogs that serve a similar audience, forums that serve my target audience, Amazon research, keyword research, and lots of social media “listening” – on Facebook pages who serve a similar audience and through Twitter searches. What I always look for is how people describe their pain or challenges around copywriting, branding and web marketing. What you’re looking for is the exact language your ideal clients or customers use to describe their challenges and frustrations, which you then mirror back to them in your content. For example, when I was doing research on photographers, one phrase I heard some variation of over and over again was, “my sad, lifeless portfolio site” – meaning these photographers may have a gorgeous website, but it’s not converting web visitors into client inquiries or paying clients – that’s the pain or frustration. So I use that exact phrase in my web copy when I’m describing the kind of challenges photographers have that I can help them with. You want to go really deep here and put yourself in your customers’ shoes and see their frustrations through their eyes. I then dumped all the data from the research, social media listening, and real life conversations into a massive document which I update every time I glean some new and useful piece of information about my ideal clients and their pain points. Ok, I know my ideal client or customer and what their challenges are, now what? Once you’ve done the work to figure exactly who your ideal clients are and precisely what their pains and frustrations, fears and desires, and hopes and dreams are, you want to apply the insights you gained into your web content, offerings, sales pages, and product descriptions, etc., weaving it through all the content creation and marketing you do. So you’re going to use the information you’ve gathered to create free content and paid offerings that solve your ideal clients’ problems, right? At this point, you’ll know all kinds of things about what they struggle with, so you could begin creating blog posts to address each one of those challenges one by one, using all the pain points you found, questions you saw on other blogs, in comments, through your social media listening, and in real life conversations. I’ll tell you, once I had a clear idea of what my ideal clients struggle with, I banged out an editorial calendar for blog post and weekly newsletter content for over 6 months, and it was easy. We’re talking 52 ideas for blog posts and weekly newsletters, in one sitting. Say it with me – sweet relief! No more struggling each week to come up with ideas for what kind of content to create. And of course you’ll also implement your newfound customer insights into your free opt-in offer, your key web pages, and your paid offerings. My best suggestion would be to begin with the About page and Home page of your website, then build out from there into all your other content and marketing messages. You can see an example of how I’ve implemented my ideal client research into my web content by taking a look at my About page, Home page, Free Resources page and Work with Me page. Your Defining Your Audience checklist, that’s what. In the checklist, I’ve sketched out my ideal client avatar so you can see the level of detail you want to shoot for with these exercises. So here’s what I suggest you do: Download the checklist, read through the audience research tactics and audience insight questions. Then read the sketch of my ideal client avatar. After you’ve done that, go back and knockout your own audience research using the checklist. Once you get your audience research done, begin implementing a few of your new found ideal customer insights into a blog post, headline, web page, or some other piece of your online presence, pronto. I started with the headline on my Home page. Just start somewhere, even if it’s small, then add more of your customer insights throughout your other content as you go. Now go and download your checklist! It’s here –>> Defining Your Audience Checklist. This is a great comprehensive and to the point post about defining your audience, Kim! Thanks for the tip about magazine covers! Makes perfect sense, I just never thought about it that way before. So glad you found the magazine covers tip useful; it’s definitely helped me! Excellent article!! Thank you. I have two very distinct styles that I work in as a painter (one modern and one traditional) should I create two separate client profiles as well a two websites, FB pages, blogs, etc. ? 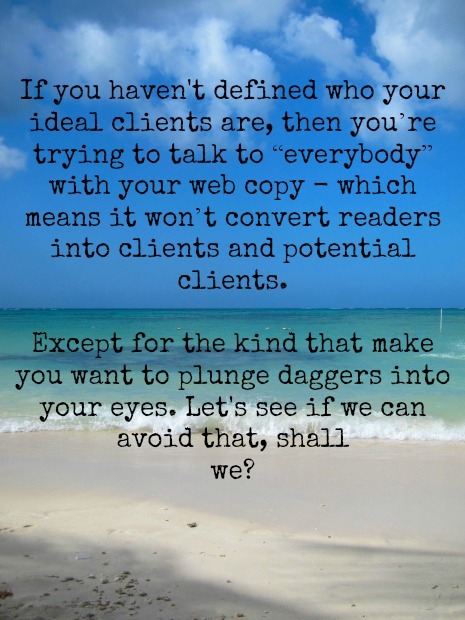 I understand that identifying my ideal client is essential to marketing success but I’m stopped in my tracks. Thanks for stopping by to comment. I’m not sure if you need to create two entirely separate profiles, as I’m sure there’s some overlap between those who are drawn to both your modern and more traditional styles of art. I’m thinking there’s likely something that unites your clients/collectors, whichever kind of art they collect, and that’s what you want to tap into with your website copy. As for creating two separate websites, blogs, FB pages, etc., no, no, no, you do not need to do that! Plenty of artists create work in more than one style or genre, and display it all on the same site/blog/FB page, etc., and that’s not a problem. My mind’s still burning from so much information and “a-ha!” moments. This is golden. And yet it makes everything so darn simpler that I can actually see myself doing it. Like, well, why not try and search for a photographer to shoot my yet-to-be-born daughter/son? I mean, I’ve done it a couple of times and I can tell you ONE THING (aka serious candidate for biggest pain point): everyone’s a great photographer but few do say anything at all about what it’s like hiring them. Sure, everyone’s got a contact page but a contact page is not enought in itself. You’ve to say something like “I’ll get back to you in the next business day”, for instance. It’s not hard. But it takes work. My own pain point was knowing what to do in the right order. Maybe you’d be amazed to know the not-so-important-now skills I have. Maybe. Now, off to homework: getting the checklist and making it my own! I’m so glad you said this –> “Everyone’s got a contact page but a contact page is not enough in itself. You’ve to say something like ‘I’ll get back to you in the next business day,’ for instance.” This is so true, and something I tell creatives to do on their websites all the time. Because people are reassured when they know what will happen next, and by when. And since so few seem to do this on their contact page, if you do, it will be one little step to setting yourself apart online.